Dentures, removable restorations for missing teeth and gum tissue, can take a number of different forms, but are usually of two different types: complete and partial. A complete denture replaces all the teeth in a given arch. A removable partial denture (RPD), on the other hand, replaces several missing teeth while using the remaining teeth as support. A common type of RPD formed of plastic is known as a “flipper” because it’s lightweight enough to be “flipped out” or moved around with the tongue. They serve an important purpose as a temporary appliance for use between periodontal treatment, implant placement and similar treatments before obtaining a more permanent restoration. 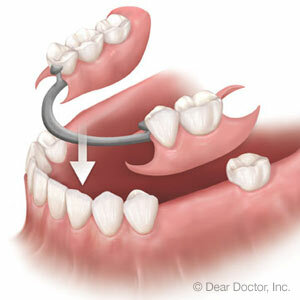 In fact, they’re often referred to as “transitional” RPDs because they’re not designed for permanent tooth replacement. Because of their low cost relative to other restorations, however, they often become the permanent choice for many people. While a well-constructed, properly fitting RPD in a healthy mouth can be an affordable alternative for people on modest budgets, their long-term use may increase the risk of dental disease and accelerated bone loss. Decades of research verify that people who permanently wear RPDs encounter more tooth decay and periodontal (gum) disease than non-wearers. This is because the attachment points of a plastic RPD to remaining teeth increases bacterial growth, which can cause both tooth decay and gum disease. This doesn’t only endanger the survival of the remaining teeth, it can lead to bone loss that will affect the RPD’s fit. While the better course is to consider RPDs as a stepping stone to dental implants or a fixed bridge, there’s an intermediary RPD constructed of cast vitallium or gold alloy that could be considered a permanent choice. These are even lighter weight than plastic and less obtrusive in their attachments in the mouth, which can reduce plaque stagnation and promote a better oral environment. Regardless of your choice in dentures, it’s always important to maintain good consistent oral hygiene with daily brushing and flossing and semi-annual professional cleanings and checkups. Keeping a healthy mouth will help reduce your risk of dental disease and increase your satisfaction with your denture of choice. Whatâ€™s So Special about Cone Beam Dental Imaging?